In the Creed, after having professed faith in the Holy Spirit, we say: “We believe in One, Holy, Catholic and Apostolic Church.” There is a deep connection between these two realities of faith: the Holy Spirit gives life to the Church, guides Her steps. Without the presence and the incessant action of the Holy Spirit, the Church could not live and could not accomplish the task that the Risen Jesus has entrusted her; to go and make disciples of all nations (cf. Mt 28:18). Evangelization is the mission of the Church, not just of a few, but my, your, our mission. The Apostle Paul exclaimed: “Woe to me if I do not preach the Gospel” (1 Cor 9:16). Everyone must be evangelizers, especially through with their life! Paul VI pointed out that “… evangelizing is in fact the grace and vocation proper to the Church, her deepest identity. She exists in order to evangelize,”(Apostolic Exhortation. Evangelii Nuntiandi, 14). Who is the real engine of evangelization in our lives and in the Church? Paul VI wrote with clarity: “It is the Holy Spirit who, today just as at the beginning of the Church, acts in every evangelizer who allows himself to be possessed and led by Him. The Holy Spirit places on his lips the words which he could not find by himself, and at the same time the Holy Spirit predisposes the soul of the hearer to be open and receptive to the Good News and to the kingdom being proclaimed.”(ibid., 75). To evangelize, then, we must be open to the action of the Spirit of God, without fear of what He asks us or where He leads us. Let us entrust ourselves to Him! He enables us to live and bear witness to our faith, and enlighten the hearts of those we meet. 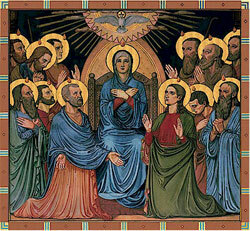 This was the Pentecost experience of the Apostles gathered with Mary in the Upper Room, ” Then there appeared to them tongues as of fire, which parted and came to rest on each one of them. And they were all filled with the Holy Spirit and began to speak in different tongues,as the Spirit enabled them to proclaim”(Acts 2:3-4). The Holy Spirit descending upon the Apostles, compels them to leave the room in which they had locked themselves in fear, makes them come out of themselves, and turns them into heralds and witnesses of the “mighty works of God” (v. 11). And this transformation wrought by the Holy Spirit is reflected in the crowd that rushed to the scene and which came “from every nation under heaven” (v. 5), so that everyone hears the words of the Apostles as if they were spoken in their own language (v. 6 ). Here is a first important effect of the Holy Spirit that guides and inspires the proclamation of the Gospel: unity, communion. At Babel, according to the Bible, the dispersion of peoples and the confusion of tongues began, the result of man’s act of arrogance and pride in wanting to build on his own strength, and without God, “a city and a tower whose top may reach unto heaven “(Gen 11:4). At Pentecost, these divisions are overcome. There is no longer more pride toward God, nor closure towards one another, but there is openness to God, to going out to announce His Word: a new language, that of love that the Holy Spirit pours into our hearts (cf. Rom 5:5), a language that everyone can understand and which, when welcomed, can be expressed in every life and in every culture. The language of the Spirit, the language of the Gospel is the language of communion, which invites us to overcome closure and indifference, division and conflict. We should all ask ourselves: how do I let myself be guided by the Holy Spirit so that my witness of faith is one of unity and communion? Do I bring the message of reconciliation and love that is the Gospel to the places where I live? Sometimes it seems that what happened at Babel is repeated today; divisions, the inability to understand each other, rivalry, envy, selfishness. What do I do with my life? Do I bring unity? Or do I divide with gossip and envy? Let us ask ourselves this. Bringing the Gospel means we in the first place must live reconciliation, forgiveness, peace, unity, love that the Holy Spirit gives us. Let us remember the words of Jesus: “By this all men will know that you are my disciples, if you love one another” (John 13:34-35). A second element: on the day of Pentecost, Peter, filled with the Holy Spirit, stands up “with the eleven” and “raided his voice” (Acts 2:14); “proclaimed” (v. 29) the good news of Jesus, who gave His life for our salvation and who God raised from the dead. Here is another effect of the Holy Spirit: Courage! the courage to proclaim the newness of the Gospel of Jesus to all, with self-confidence (parrhesia), in a loud voice, in every time and in every place. And this happens even today for the Church and for each of us: from the fire of Pentecost, from the action of the Holy Spirit, ever new missionary energies are released, new ways in which to proclaim the message of salvation, new courage to evangelize. Never be closed to this action! May we live the Gospel with humility and courage! May we witness the novelty, the hope, the joy that the Lord brings to life. Let us feel within us “the delightful and comforting joy of evangelizing” (Paul VI, Apostolic Exhortation. Ap. Evangelii nuntiandi, 80) Because evangelizing, announcing Jesus, evangelizing brings us joy! It energizes us. Being closed up within ourselves brings bitterness. Proclaiming the joy and hope that the Lord brings to world lifts us up! I will only mention a third element, but it is particularly important: a new evangelization, a Church that evangelizes must always start from prayer, from asking, like the Apostles in the Upper Room, for the fire of the Holy Spirit. Only a faithful and intense relationship with God allows us to leave our enclosures and announce the Gospel with parrhesia. Without prayer our actions become empty and our proclamation soulless, it is not animated by the Spirit. Dear friends, as said Benedict XVI, the Church today ” especially feels the wind of the Holy Spirit that helps us, shows us the right path, and so, with new enthusiasm, we are on our journey and we thank the Lord” (Address to Assembly of the Synod of Bishops, October 27, 2012). Let us renew our trust in the Holy Spirit every day. The trust that He enacts in us, He is in us, He gives us courage, confidence and peace! Let us be guided by Him, men and women of prayer, witnessing the Gospel with courage, becoming instruments in our world of God’s unity and communion.